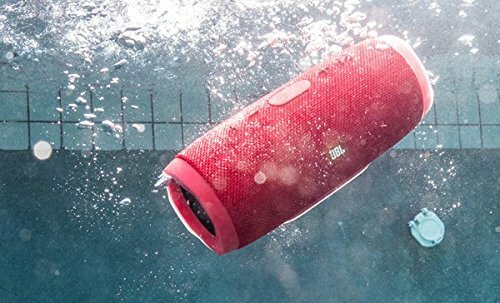 JBL Charge 3 Powerful Portable Speaker with Built-in Powerbank + High Bass. It Has Bluetooth Connectivity By Using This You Can Directly Connect Your Mobile Phone To Play Music. This Is A Wireless Bluetooth Streaming Speaker, it Has Built-in 6000mAh power bank. You Can Use Phone Call Features Directly In It And Use It As A Speakerphone. A built-in noise and echo-canceling speakerphone give you crystal clear calls with the press of a button. It Is A IPX7 waterproof Speaker. One Of The Coolest Features Of This Charge 3 Plus Is The JBL Connect And JBL Bass Radiator Which Gives A Powerful Bass Into Your Played Song. Hear the bass, feel the bass, see the bass. Dual external passive radiators demonstrate just how powerful your speakers are. JBL Charge 3 is the ultimate, high-powered portable Bluetooth speaker with powerful stereo sound and a power bank all in one package. The Charge 3 takes the party everywhere, poolside or in the rain, thanks to the waterproof design, durable fabric, and rugged housing. A built-in noise and echo-canceling speakerphone give you crystal clear calls with the press of a button. Wirelessly link multiple JBL Connect-enabled speakers to amplify the listening experience. Price Of Jbl Charge 3: 10,777 Rs In India.